A delegation from Latvian Academy of Sciences visited Pakistan Academy of Sciences to formalize arrangements for mutual cooperation and collaboration and for building broad-based, substantive and long-term relationship with Pakistan Academy of Sciences in a wide array of scientific and technological disciplines. 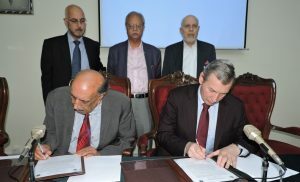 A Memorandum of Understanding (MoU) for cooperation between Science Academies of the two countries was signed on March 22, 2016 in a well attended ceremony at PAS Headquarters, Islamabad by the President of Latvian Academy of Sciences, Dr. Ojar SPARITIS and the President of Pakistan Academy of Sciences,Dr. Anwar Nasim. Dr. SPARITIS, apprised the audience that by working on fundamental and applied sciences with innovative S&T we can stay competitive in the world. He offered collaboration in all areas of S&T by way of joint projects, reciprocal visits of scientists, and joint conferences.